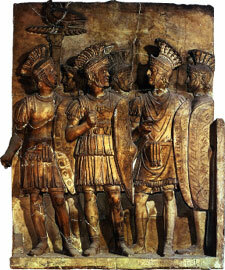 Bas-Relief - The Roman soldiers seen here are examples of bas-relief sculpture, in which the figures stand out from the background. Build on What You Know You have already read that Greek and Hellenistic culture came before the Romans. Early in its history, Rome conquered Greece. Some of the Greek culture influenced Roman culture. ESSENTIAL QUESTION How did Roman culture differ from Greek culture? Roman culture was based on values of strength, loyalty, and practicality. The Romans picked up Greek ideas about the artistic ideal and Greek styles of writing. The result was a culture that blended Roman practicality with elements of Greek idealism and style. Roman artists were especially skillful at creating mosaics. A mosaic is a picture made from tiny pieces of colored stone or other material. One famous example shows Alexander the Great in battle. This mosaic was found at Pompeii and measures 10 by 19 feet. Many mosaics show scenes of daily life. 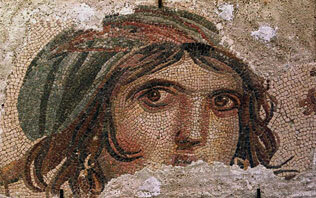 Mosaic - This Roman mosaic was discovered in 2000 by archaeologists working in southeastern Turkey. Romans learned about sculpture from the Greeks but did not follow the Greek tradition of showing the ideal. Instead, the Romans created sculptures that were realistic portraits of bas-relief. In a bas-relief, slightly raised figures stand out against a flat background. The Greeks also influenced Roman literature. Roman writers adopted the form of the epic, a long poem about a hero's adventures. The Aeneid by Virgil is a well-known Roman epic. Virgil modeled his poem on two Greek epics, the Odyssey and the Iliad. The Aeneid tells the adventures of the hero Aeneas, who survived the Trojan War, sailed to Italy, and founded Rome. The works of the statesman Cicero provide a picture of Roman life and add to our knowledge of Roman history. Cicero's written works include his speeches. Cicero was a master of oratory, the art of public speaking. Oratory was an important means of persuasion for Roman politicians. Romans also wrote about philosophy. For example, Emperor Marcus Aurelius wrote the Meditations, a work expressing the ideas of Stoicism. Stoicism teaches that the world was created by a divine plan. Duty and virtue help people to live by that plan. Latin, the language of Rome, was spoken across the Western Empire. Over time, Latin evolved into a group of languages called the Romance languages. (The word romance comes from the word Roman.) Today, Romance languages are spoken in countries whose lands were once ruled by Rome. The chart below shows similarities among Romance languages. ESSENTIAL QUESTION How did Roman ideas about architecture and engineering influence builders throughout history? Greek architecture influenced Roman builders. You've already learned about the Greek building style, with its use of columns, pediments, and graceful proportions. The Romans used these elements but added their own ideas too. Roman builders were excellent engineers. They found new ways to improve the structure of buildings. 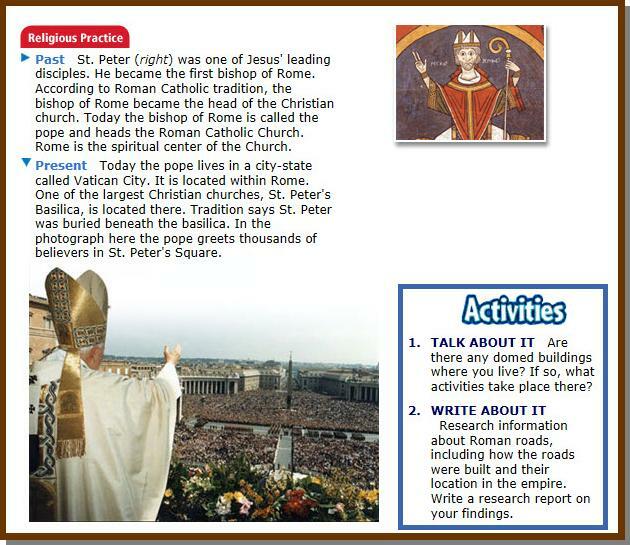 These ideas included the use of arches, vaults, and domes. A vault is an arch that forms a ceiling or a roof. Roman developments in building construction made it possible to build larger, taller buildings. Many modern buildings borrow Roman elements of design and structure. The dome of the U.S. Capitol building is a well-known example. The Romans developed a form of concrete that was both light and strong. They poured the mixture into hollow walls or over curved forms to create strong vaults. Concrete is a common building material today. The Romans built aqueducts to bring water to cities. An aqueduct is a waterway made by people. Aqueducts brought water to public fountains, where people collected water for their homes. Aqueducts also supplied water to public toilets and bathhouses. Eleven major aqueducts brought water to the city of Rome. The longest stretched for 57 miles. 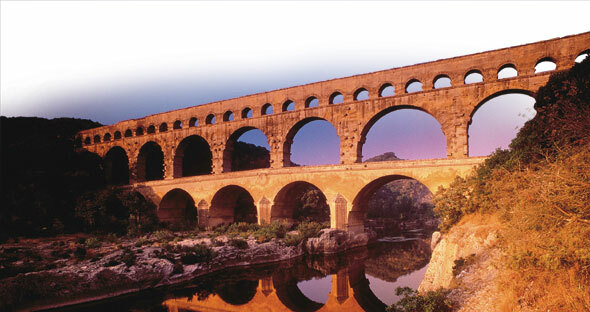 Aqueducts can still be found in France and Spain, lands that were once part of the Roman Empire. Remains of a Roman Aqueduct - This aqueduct is near Nîmes, France. It was constructed more than 2,000 years ago. The Romans are especially famous for the quality of their roads. In 312 B.C., Romans built the first of many roads. It was called the Appian Way, and it ran southeast from Rome. In time, a system of roads extended across much of the empire. Rome was the center of this network. Many Roman roads were built so that soldiers could move quickly to places in the empire where they were needed. The road system also increased trade because merchants and traders could move their goods more easily. Although the road system helped hold the Roman Empire together, it also made it easier for its enemies to invade. 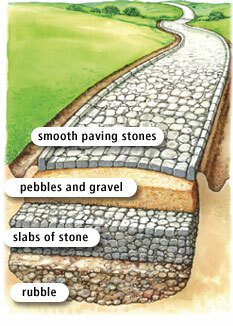 Roman Road Construction - Roman roads were constructed in layers. The average width of a road was 15 to 18 feet. ESSENTIAL QUESTION What religious and legal legacies did Rome leave? Past civilizations leave their mark through ideas as well as through objects. 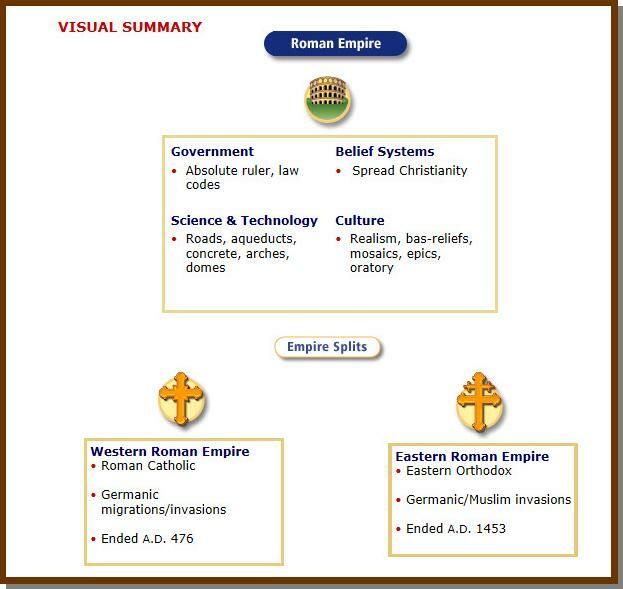 The western and eastern parts of the Roman Empire had great influence in the areas of religion and law. The Roman Empire played a major role in the spread of Christianity. Christian missionaries converted many within the empire. The Roman Catholic Church became the powerful organization in Western Europe. The Eastern Orthodox Church, which was the official religion of the Byzantine Empire, also spread Christianity. Many Russians and members of societies on the border of the Byzantine Empire became Eastern Orthodox Christians. With both the Roman Catholic and Eastern Orthodox churches spreading Christianity, most of Europe and some parts of western Asia became Christian. The structure of the Roman Republic influenced the writers of the U.S. Constitution. Roman senators made up the main political body of the republic. Early U.S. citizens followed this example by providing for their own Senate in Article I of the Constitution. Laws in today's democracies evolved from those of ancient Rome and Byzantine. These laws include the right to own property and to make contracts and write wills. In the Roman Republic citizens had the right to equal treatment under the law. This principle of equality inspired the creators of democracies in the United States and France. Roman writers and artists were inspired by Greek culture, which they combined with their own ideas. Roman builders and engineers developed styles and construction methods that continue to be used. Roman laws and government continue to serve as models for modern countries. Many areas of modern life—from government to architecture to language—still carry the mark of the Roman Empire.